The 10" All-Metal Seamless Flatbed provides the perfect work space for projects large and small. In addition, quilters can enjoy exceptionally smooth quilt piecing with the included AcuFeed™ Flex Layered Fabric Feeding System. 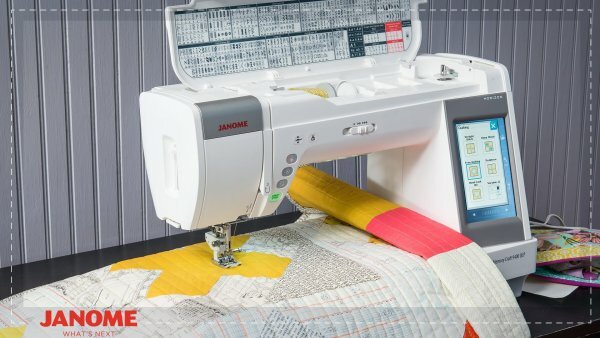 The Janome Memory Craft 9400 has an advanced LCD touchscreen that shows all of the information you need to sew with ease. Select new stitches and memorize your favorites for quick access! As well as an adjustable High Light™ and 9 bright LED’s to illuminate the bed area of your machine. 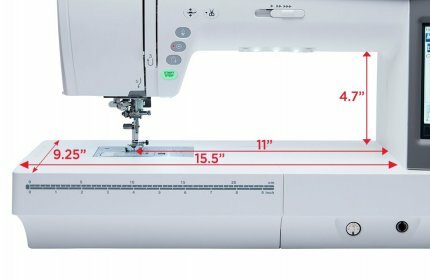 The Easy Convenience Features of the MC9400 let you get more out of your sewing time. The most important functions are perfectly placed for effortless access. There is an Automatic Presser Foot Lift, Needle Up/Down and Thread Snips along with a Start/Stop, Reverse and Locking Stitch Button. Once you sew with these great features, you won’t be able to do without! And with it’s built-in needle threader and number thread guide, threading your machine has never been easier! The Janome Memory Craft 9400 features a Top Loading Full Rotary Hook Bobbin System, 350 Built-In Stitches and 4 Alphabets, Superior Needle Threader, One-Step Needle Plate Conversion with 3 Included Plates, Detachable AcuFeed Flex Layered Fabric Feeding System, USB Port and Direct PC Connection, Stitch Composer Stitch Creation Software, Variable Zig-Zag for Free Motion Quilting, Straight Stitch Needle Plate with Left Needle Position for 1/4″ Seam Foot, Professional HP Needle Plate and Foot, Advanced Plate Markings, Full Color LCD Touchscreen (4.4″ x 2.5″), Sewing Applications On-Screen Support, Maximum Sewing Speed: 1,060 SPM, Full Intensity Lighting System with 9 White LED Lamps in 4 Locations, 11″ to the Right of the Needle, Improved Ergonomic Shape, Retractable High Light.